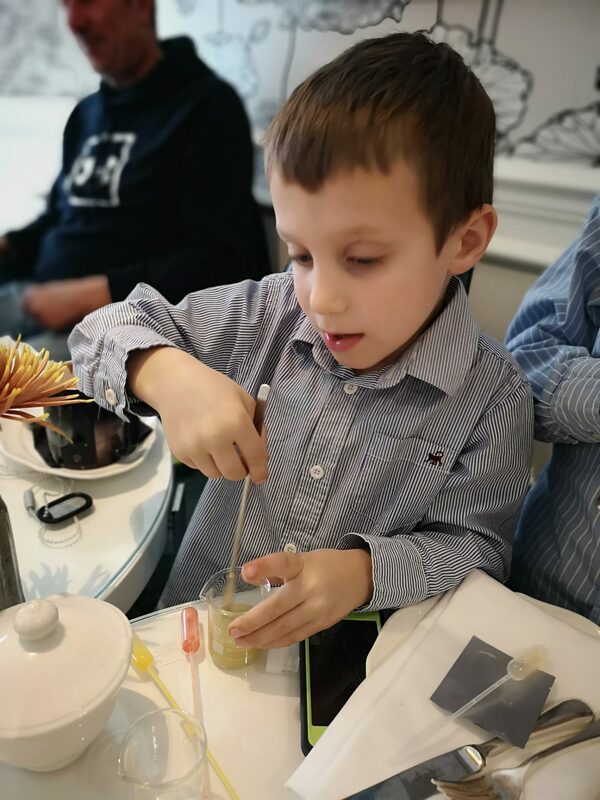 Afternoon tea has to be one of my favourite things to do and when we recently had the opportunity to try the science themed afternoon tea, at the Ampersand Hotel in London, we jumped at the chance. 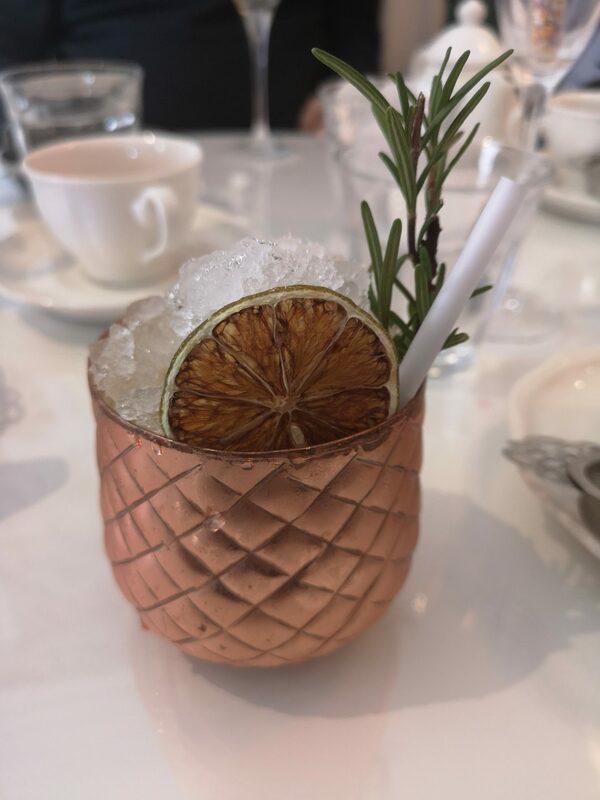 I had recently stumbled across the science themed afternoon tea, when I came across an article on London’s quirkiest afternoon teas. 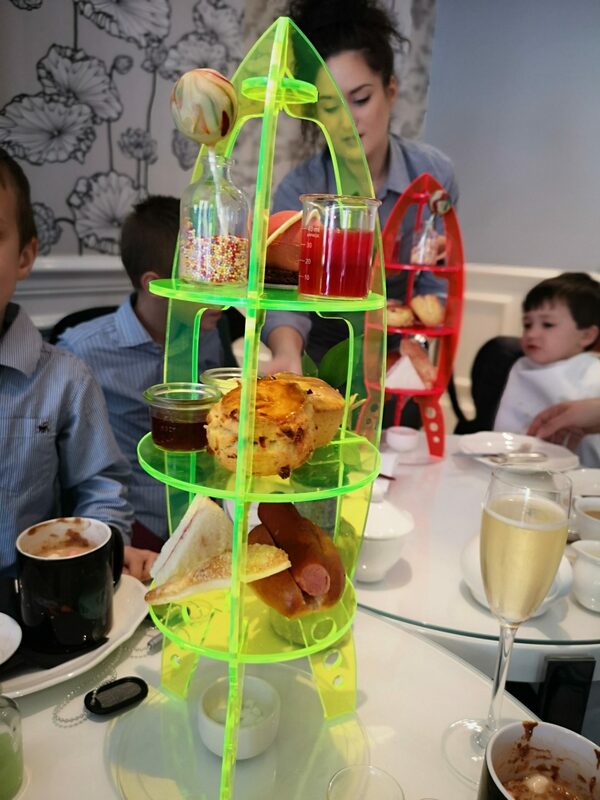 I thought it would be a perfect way to experience an afternoon tea that would also entertain the kids at the same time and I certainly wasn’t wrong! We booked our table about a month in advance through Bookatable. It is very popular, so it’s definitely worth booking in advance. 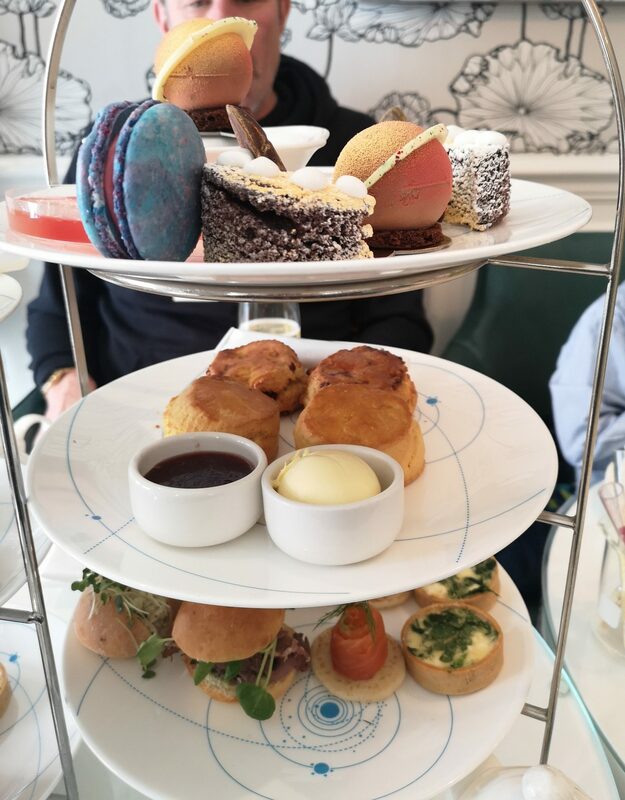 We went with friends and there was 8 of us in total, so we booked a table for 12.30pm, slightly earlier than the more typical time for afternoon tea. 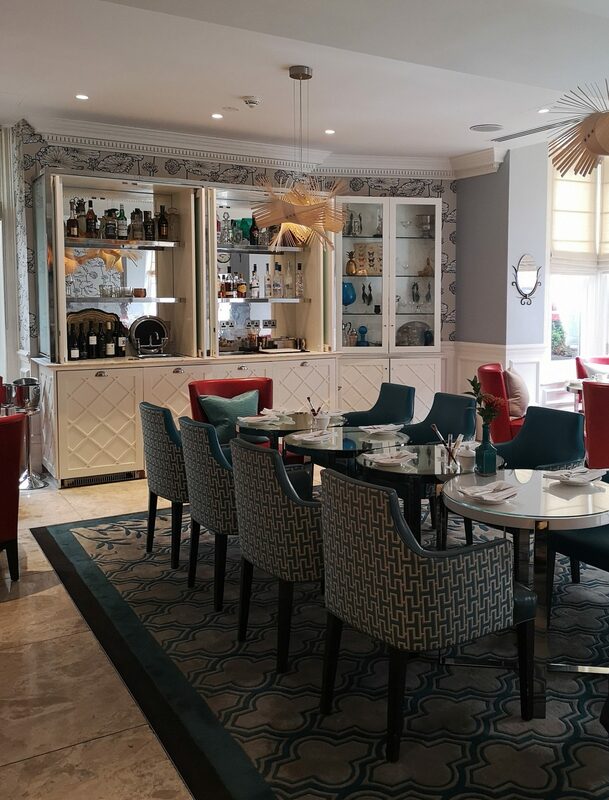 The Ampersand Hotel is a gorgeous boutique hotel, located literally a stones throw from South Kensington underground station. As it was so close to the station, we arrived about 15 minutes early, which wasn’t a problem. We were shown to our table in the hotel’s Drawing Room, which was lovely. Nice bright and modern contemporary decor, whilst still retaining the gorgeous period features of the hotel. Our table was at the back of the room and meant we had that area to ourselves for most of the time we were there. We took our seats and the kids started to get really excited when they discovered a beaker with test tubes and a brush in the middle of the table. 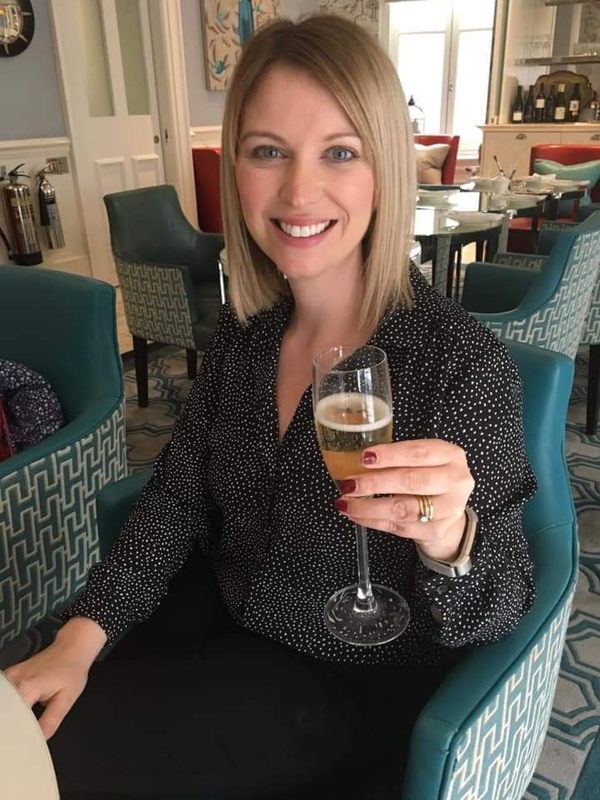 We quickly browsed the menu, although we all knew that the science afternoon tea was what we wanted, the adults just needed to decide whether to go with the champagne option or not – we did! 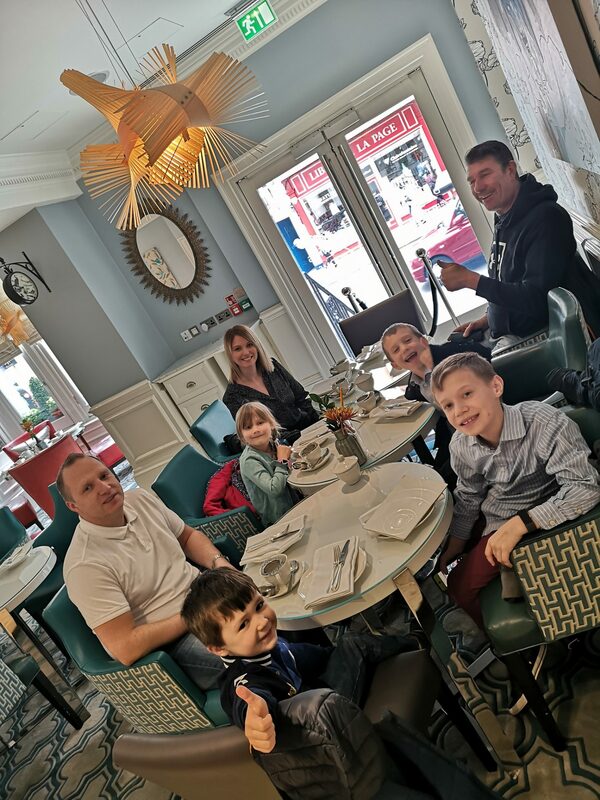 We had four children with us and rather than go for a stand each we decided to order two children’s afternoon teas and order more if we needed it. 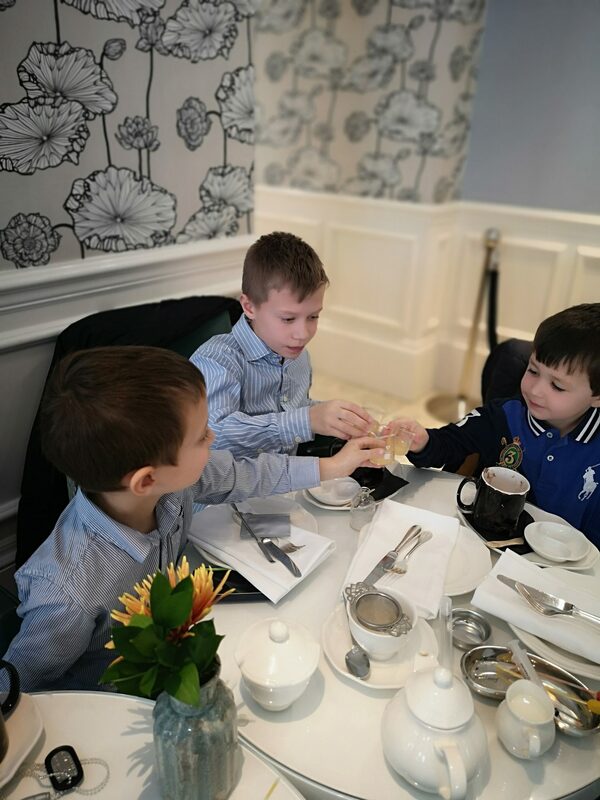 The children’s afternoon tea comes with hot chocolate rather than tea, so we ordered an extra two to ensure everyone had their own drink. We didn’t have to wait long before the drinks arrived. 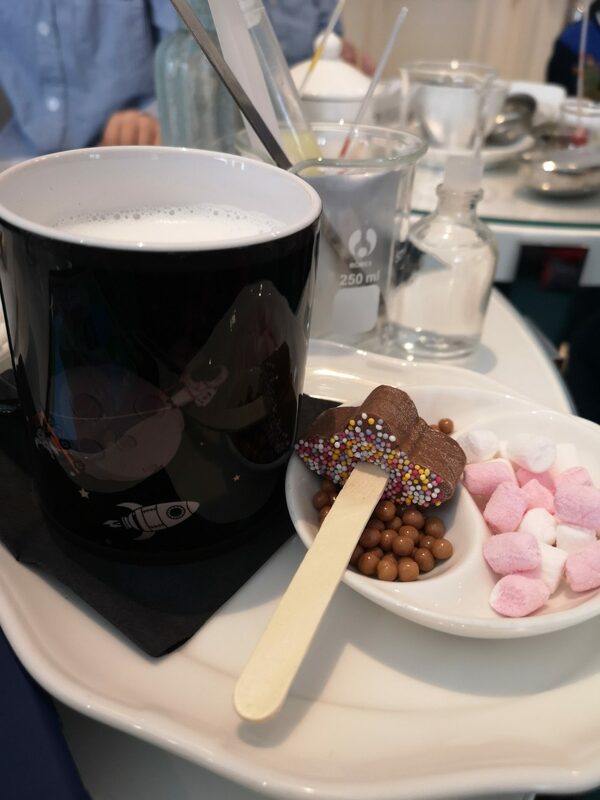 The hot chocolates were brilliant and came in space themed mugs that changed colour as the mug got hotter, along with marshmallows, chocolate balls and a chocolate on a spoon that you dipped into the cups to make the milk go chocolatey. The waitress also brought out beakers with syringes and test tubes to make flavoured lemonade. 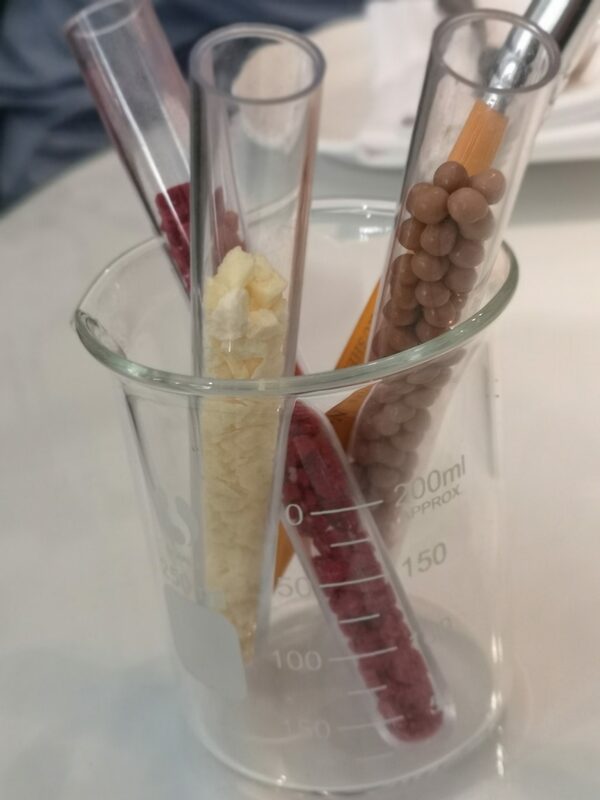 We had to mix various things together, adding water and flavouring with pipettes and to make different flavours. The kids absolutely loved it and were in their element mixing up a range of ‘potions’, whilst the adults sipped on champagne. Next out were the food stands. The children’s brightly coloured rockets stand were bought out first and caused lots of excitement. On the stands were hot dogs, jam sandwiches, a rocket shaped cheese pastry, scones, jelly, a chocolate moumou planet and a cake pop with sprinkles. The kids couldn’t believe their luck. The adult’s stands were then delivered to the table and again, there was lots of oohing and ahhing! On our stands we had mini feta tarts, beef and chicken rolls and smoked salmon on a blini. 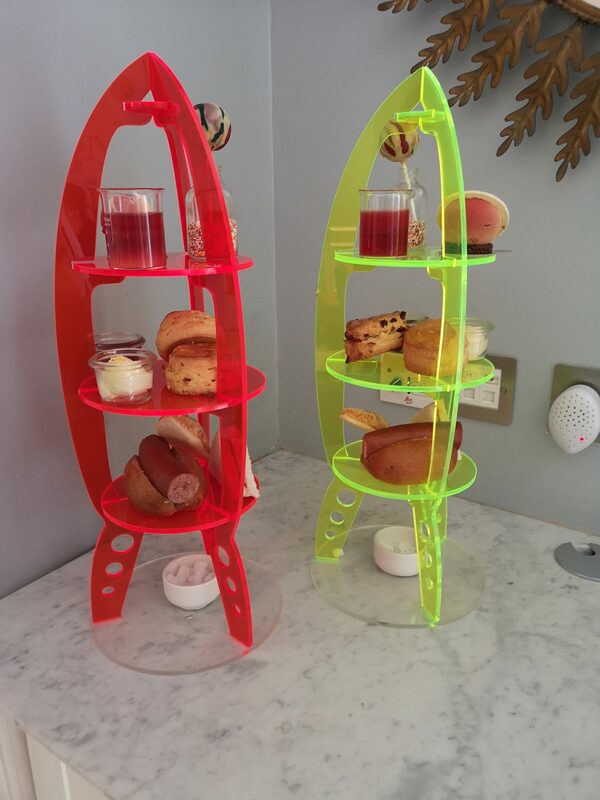 On the second tier were plain and cranberry and white chocolate scones with clotted cream, jam and lemon curd served in a squeezy tube. 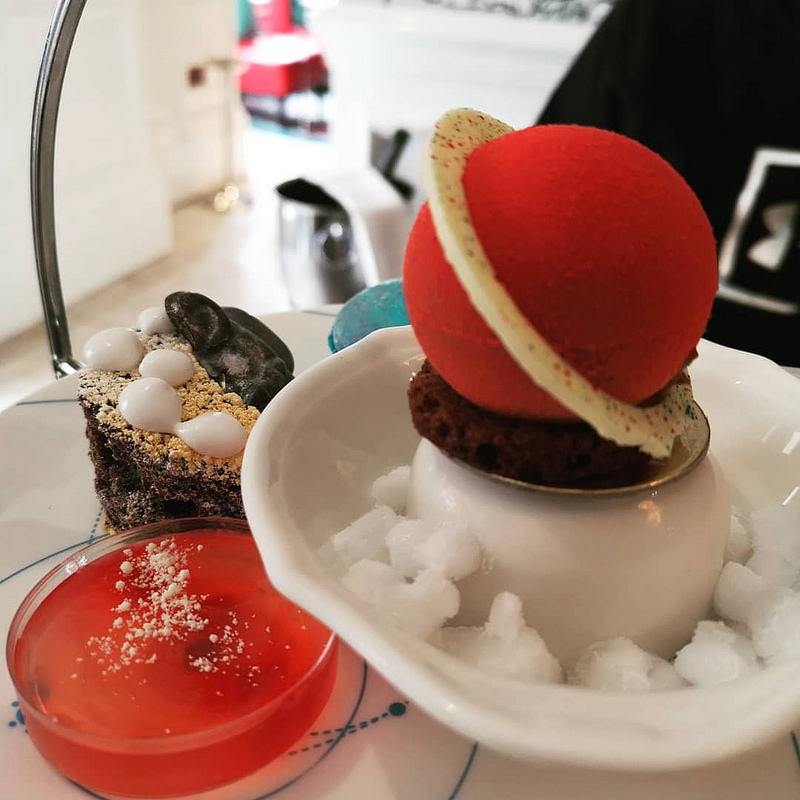 On the top was rhubarb and cranberry jelly in a petri dish, a dark chocolate and passion fruit ‘planet’ mousse, a chocolate and coconut half-moon cake, a spaceman chocolate and redcurrent and lychee macaroon. Before we all tucked in, our waitress poured water on to the dry ice, which was at the bottom of each stand. This created a smoke effect, so it looked like the rockets were about to take off. A really lovely touch. We started with the savoury bits first and everything (apart from the salmon, which I gave to Oscar) was very tasty, particularly the beef roll. The staff asked if we wanted any more savouries, so we ordered an extra roll each. We then moved on to the beautiful warm scones. I thought the cranberry and white chocolate scones were particular tasty. It was then time for the sweet treats on the top, which were delicious. I really liked the macaroon and the chocolate and coconut moon cake, which was super light. Everyone thought the food was brilliant and we were all full at the end. The kids all ate loads, although we felt that two stands between the four of them was definitely enough. Once we’d finished eating the adults ordered cocktails, which were lovely and definitely had a kick. Whilst the kids used the paint brush to discover space chocolate in wooden boxes covered with oreo ‘dust’. The whole experience was absolutely brilliant. We were in there about two hours and both the adults and kids loved every minute. It’s the perfect treat for a special occasion and we’d highly recommend it, it’s worth every penny. The science afternoon tea is served Monday to Saturday from 12.30pm – 9pm and on a Sunday from 12.30pm – 7pm. It’s £39.50 for adults, or £49.50 with champagne and was £29.50 for each of the children’s stands. You can book at Bookatable who have a special section dedicated to themed afternoon teas. 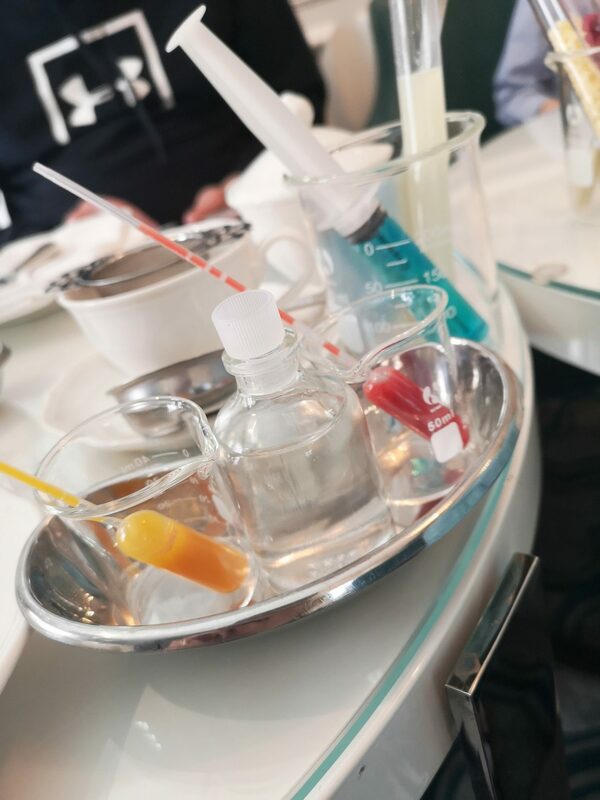 Disclosure: we were asked to review the science themed afternoon tea by Bookatable in return for a contribution towards the cost of the experience. As ever all opinions are my own. 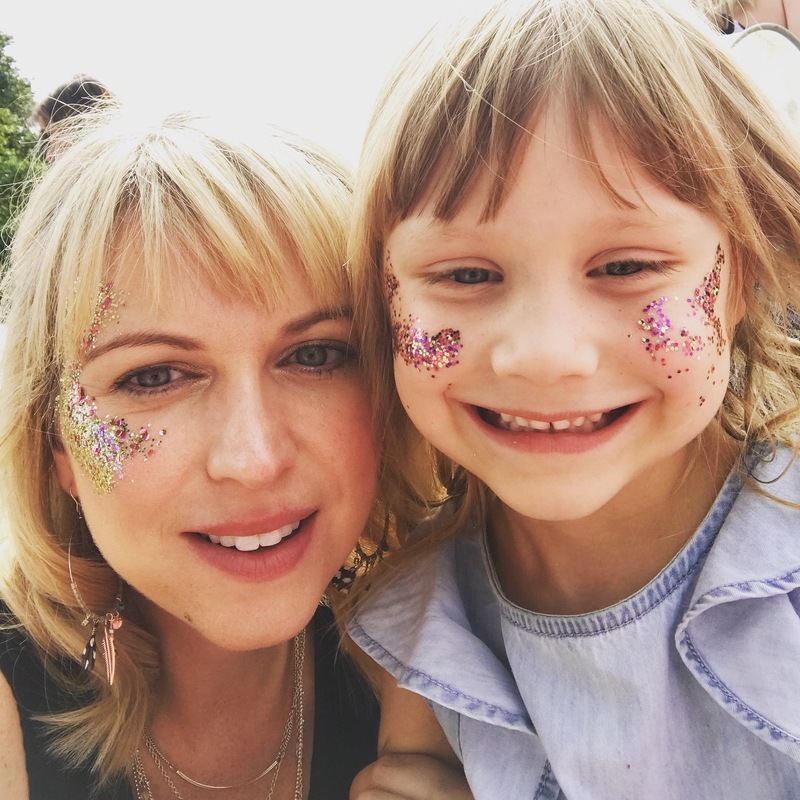 Next Post Keeping kids entertained on a rainy day without resorting to devices!